There were only three designs of 4 compartment clerestory coach with a central luggage compartment. Two designs, diagrams U27 and U28, are classified as CAA12N and are described below. A third design, diagram U29, had transitional design sides and is classified as CAA7TN. There were 20 coaches built to diagram U27 and 10 to U28, all in 1883. Distinguishing between the two diagrams can be difficult. Both were 31' long x 8' wide. The key is that U28 had symmetrical compartments and this can be seen in the width of the panels between the compartment windows. Even so it can be difficult to tell between the two designs, especially is later years when the panelling was plated over, sometimes completly, and sometimes partially. These are my drawings of the designs based upon information in the Diagram Book at York, and I hope you can see the difference the in compartment dimensions. Great Western Branch Line Modelling, part 2, page 88. 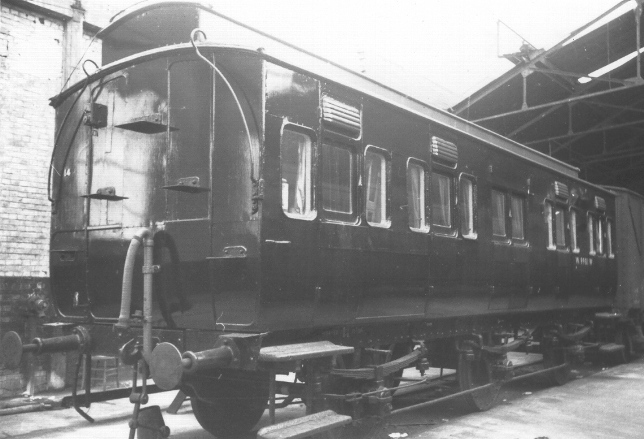 First coach is U27 and the third coach is a U29 (notice the transitional style sides where compartment windows are taller than the door windows). This U27 number W9981W ex 6196, it was converted to a camping coach in the mid 1930s and now appears to be in BR all black departmental livery. I have only seen one photo of a U28, It is in Great Western Coaches, volume 1, page 75.